Nestled next to a wildlife preserve and a short walk to the beach. Dog Friendly! Welcome to Legasea on the Pond Located in north Manzanita Neah-Kah-Nie. Living room offers great views and many comfortable seating choices. Table has a leaf extension to sit 6 total. Views of the wetland. Upstairs leads to Master bedroom/living room/ kitchen and deck. Stone wood burning fire place wood not provided Lots of space to prep and cook in the kitchen. Large sink. Stainless steel appliances, well stocked and organized kitchen with open concept to dining and living room. Downstairs bathroom with a shower. Washer and dryer for guest use, detergents provided. Just past the kitchen to the left is the master King bedroom. King master includes a TV to relax and watch. Bedroom also has access to the large wrap around deck. Bathroom has tub and shower with large windows to provide natural lighting. Downstairs bedroom has a large lounge chair & TV with DVD player with access to the patio. The downstairs bedroom has 1Q, 1F, 1Twin trundle ,and 1 queen fold out couch. Plenty of games in the closet to play. Perfect space to BBQ. Enjoy a nice day with a drink or meal on the deck. Choose any seat you would like and witness the various wildlife in the wetlands. Seating overlooking the wetlands. BBQ provided for guest use. Depending on the time of year you`ll see gorgeous birds and even elk or deer. Space to soak in the sun or watch a storm. The deck has a peak of the ocean. Side view of Legasea on the Pond. Thank you for visiting Legasea on the Pond Sunsets are just a 2 minute walk away. "Legasea on the Pond" is the perfect retreat for two couples or a family with children. The home offers a reverse floor plan with the main living area and master bedroom on the upper level and the large second bedroom on the lower entry level. The open floor plan, with wood floors throughout the kitchen, living and dining area creates a rich, warm environment. The living room feels like the perfect lodge with a wall of windows that face west allowing in lots of natural light. Cozy into the plush, leather furnishings and enjoy a fire in the floor to ceiling, river rock, wood burning fireplace while watching a beautiful, Oregon coast sunset. The beautiful master bedroom, just down the hall from the living area, features a king size bed, wall mounted TV and large windows above the bed allowing in more natural lighting. There is also access to the large wrap around deck from this room and a private door to the hall bath that includes a tub and shower. The lower level features a beautiful foyer with exposed aggregate flooring and a large second media/bedroom that sleeps six comfortably. Guests can enjoy the game or a favorite movie on the large 42" flat screen TV/DVD player. The room features a queen bed, a full size bed with a twin trundle and a queen sleeper sofa. You also have beautiful views of the beaver pond and can access the large backyard patio from this room. 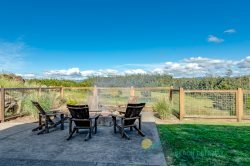 Enjoy a fire in the portable outdoor fireplace or a family barbecue while watching all the wetland wildlife. Hike the many trails of Neahkahnie Mountain or walk the seven miles of pristine beach during your stay at the Legasea on the Pond. This home is truly a wonderful retreat and a great place for kids and the family pet. Abundant amount of natural light through all windows. All necessary windows have coverings. One dog, must be at least two years of age, and flea treated. No cats allowed. Laundry, dish, shower, and hand soaps all provided. Paper towels, toilet paper, coffee filters and napkins all provided. From Airbnb: This light-filled home is in my favorite location in the Manzanita area. Neahkahnie feels like its own little world and the bird activity in the wetland is fascinating - all just a quick walk to the beach and south into town. The house is sparkling clean and well equipped for cooking, relaxing and socializing. Perfect for a couple using just the upper level or for two couples with kids. Loved every minute of our 3-night stay. Love this home, its our second time staying here. Very comfortable and nicely renovated. Love cooking in the kitchen everything was perfect and enjoyed having our dog with us. Everyone was helpful and the booking was easy. Check-in and check-out procedures were thoroughly explained and easy to follow. I felt the welcome note was a nice touch as well as the check-in and check-out instructions. This made it feel welcoming. It's so hard to pick one "favorite" feature! The amenities all together: The convenient location, huge windows overlooking the woods and ocean, the kitchen tools, washer and dryer, the peace and quiet. This is one of those places where you can park your car and walk to where you need. Every day, I'd wake up, stride into town via the beach while embracing every seascape sound. Manzanita has everything you need that pairs well with a chill lifestyle: Gourmet coffee shops, specialty food & cafes, locally owned book nook, and boutique vendors. Go to the Spa at Manzanita! Its a must! Id spend the afternoons hiking on the nearby trails (very safe and well-marked): Mt. Neahkahnie, Short Beach (youll see lots of surfers here! ), and Cape Falcon. Seriously, maybe a 5 minute drive. Id cook dinner each night at the house, from the fully equipped kitchen while listening to the waves. And, I was able to sit at the kitchen table and journal in peace. While falling asleep each night, I was treated with a pleasant rain. The views from inside the house were just as good as being outside - except cozier - just sit on one of their comfortable living room chairs/couches and look out. The home was spotless clean, ocean-rustic decorated, and warm. I loved the attention to detail: The towels, washer and dryer (needed it! ), book lights, and place where you could wash the sand off your boots/shoes before entering the home. I was glad took my getaway in November: The town was quiet. I needed the peace. The amazing deck with ocean view! We love the deck and windows allowing for ocean breezes to fill the house. We received excellent service from the booking to the checkout process. We had a fun family time as ways. We will be back for sure. This home was tastefully remodeled with very nice finishes. It had everything one could possibly need and more. Felt very private and only a two min walk to the beach. It was very clean and well taken care of with high end appliances. We so appreciated this comfortable, lovely home and that we could bring our little white dog, Benny. Thank you so much for sharing this home with us. Well definitely stay here again! Loved the fireplace, deck and Weber bbq! We never needed to see the team, as everything was perfect when we got there--really, perfect. It could not have been more wonderful. The location, the deck, the view of the wetlands, the proximity to the beach, the wonderful great room, the sleeping room, we had an absolutely wonderful time. Everything was perfect. I definitely want to come back . . . or live there indefinitely. We always appreciate the prompt and friendly service provided by your team. I made two phone calls after booking online. Each person I spoke with was very helpful and eager to help with my questions. It was comfortable, clean, and so convenient to town and the beach! The furnishings were nice, the bed was comfortable. The kitchen is better stocked than my own at home. Loved the washer/dryer! Actually like that the property was a block from the beach. We could see the ocean clearly, but still could get away from it. The sun was relentless when we were there--and the temp was 99 degrees.To look at the ocean through the pond greenery almost a relief. The house did get hot on the second level from about 3pm til 10 pm. No air conditioning. Things significantly cooled off at nite.